We accept payment via Visa , MasterCard, Discover, AMEX, PayPal, BitPay, Money Order/Cashiers Check, and wire transfer. Performance PC's reserves the right to deny any sale for reasons of fraud or misappropriation of funds. Performance PC's also uses AVS (address verification system) to prevent credit card fraud. Please make sure the shipping address matches up with the issuance name on the credit card. The "Ship to" address must match billing address unless you have the other address on file with your credit card issuing company. Our "no hassle" customer service is excellent. Our secure server is easy and safe to use so feel totally comfortable paying online with us. With Western Union wire transfer you should check out with the "Western Union Wire" option. Reference your order in any wire transfer and when complete email us the senders Full name, city and country, amount sent, and the money control number. We do not accept International Checks or Money Orders. You may send us a Money Order or Certified Bank Check for immediate order processing. We only do direct bank account transfers for large orders. Email us for details. If you send us a personal check, it will take 7 to 10 business days for the check to clear before we will ship the order. Our product description pages show the weight of each product. This is NOT the actual shipping weight. This "weight" is used by us to calculate the shipping charge. It is not the weight of the item. Many times we set weight so that we have a fair shipping charge which includes packing materials, boxes, etc. We will make every attempt to NOT overcharge on shipping. We only accept orders directly from the shopping cart. In order for us to ship internationally you must check-out through the cart and be able to pay via PayPal, Bitpay, or send a Western Union wire transfer to complete payment. If you wish to pay with Western Union Wire there is a minimum order of $100 excluding shipping for us to accept this. We only do direct bank account transfers for large orders over $1000.00 US for no extra fee. If you wish to do a direct bank transfer for an order under $1000.00 then you will have to pay the incoming wire fee of $25.00 that we incur. At Checkout with Wire transfer you will receiving banking details to make the wire transfer successfully. Please include the $25.00 incoming wire fee we will be charged in your total wire transfer amount. Due to FedEx's very high brokerage fees for Customs we recommend you ship US Express Mail. This option has tracking and can be insured and recommended for any order over $50 US. US Priority Mail (2-4 weeks average) has tracking but is only insured $50.00 by default. First Class Mail has no tracking after it has left the United States, no insurance outside of the US and Canada, and can take much longer to arrive based on how fast or slow your Customs Department handles it (3-6 weeks average). If you select First Class Mail outside of the US and Canada it is at your own risk. Any package that does not arrive will be your loss as this service CANNOT be insured or tracked outside of the US and Canada. So please make sure you can agree to the risk when selecting First Class Mail. If time is sensitive and you want true tracking and guaranteed delivery times, then we suggest only to use Fedex or DHL for shipping. When selecting FedEx or DHL please be informed that you WILL HAVE TO PAY A BROKERAGE FEE WHEN YOUR PACKAGE ARRIVES. Our shipping fees are for SHIPPING ONLY and DO NOT include any taxes or duties that your country charges on imports. So please note that you are responsible to pay this fee when selecting FedEx shipping to be able to receive your package. We have nothing to do with your countries taxes and how much they charge on imports. PLEASE DO NOT call or email us in regards to why you are being asked to pay a FedEx, DHL brokerage fee when selecting the these ship methods for International! You are expected to read all the store policies on the site prior to ordering and know what to expect in regards to the arrival of your shipments. If your order is being shipped to Mexico and it contains Fluid, thermal paste/pads, cleaner, compound or any chemical- you will need to assign your own broker to clear customs. Fed-Ex will not clear these items and the cost for the broker and any customs fees are the sole responsibility of the receiver. If a broker is not assigned the package will be abandoned and no refund will be issued. Gift wrapping is not available for international orders as most gift wrapped items are opened when moving thru customs. The gift wrap charge will be refunded when selected for international orders. Finally, please note that there are certain countries we will not ship to regardless of payment. Please contact us first if you have any questions relating to that. You will be contacted by a customer service representative when your order is ready for pick-up. If you are paying with cash please have exact change. All store pick-ups will be held for 30 days. Any order that exceeds this time frame will be refunded. In addition, Performance PC's, Inc. will assess a 20% restocking fee on any order that is not picked up with-in this time frame. Please note that orders of $100 or more paid for with a credit card and shipped to an apartment will require a signature for delivery. Exceptions to this will be made for customers with accounts and at least a six-month order history of shipping to this address. * If you meet the exception requirements you must email Shipping@performance-pcs.com with your request BEFORE your order ships. Signatures cannot be removed after the order has been shipped. Please include order number in email. The choices for shipping will be FedEx and US Priority Mail. DHL is only available for international shipments. There will be times when we will have to reserve the right to choose an alternative method of shipping, and we will notify you of any changes. We can not be responsible for any US Mail packages that are lost after the show "Delivered" by the USPS tracking #. If the Delivery Confirmation number for the packages shows "Delivered" and you do not have the package, you need to speak to you local mail carrier or local Postmaster. We have no other information to provide you on this and so you must ask the PO where they left the package. Please do not call or email us because we will not have anything to check on for this. It must be done in your own city and with your own local PO, none of which we are able to contact via any method, phone or email. Even if you call the USPS 800 number they will not be able to help you and direct you to contact your local Postmaster/carrier. Priority Mail and Express Mail is only insured $50.00, and FedEx is only insured $100.00, so keep that in mind for more expensive shipments and choose the optional shipping insurance during the checkout process with you expect to be covered! For DHL we use a 3rd party insurance carrier and so shipments have no insurance by default. Again if you expect to be covered for loss or damage, please make sure you choose the optional insurance at checkout. If you accept and sign for a damaged box, it is your responsibility to save all the packing materials and box for carriers inspection. Failure to keep your packing material will void any possibility or us making a claim and replacing your product! So please keep this in mind for any shipment received to retain all pack materials until everything in the package is fully inspected! Priority Mail only offers delivery confirmation service and this is not true tracking. USPS in Palm Bay does not always scan in packages for commercial customers so "tracking" (Delivery Confirmation #) status will often remain the same until the package is actually delivered. Often the shipments only show the a Shipping label was made. Rest assured that if the staus of your order shows "Shipped", your package was picked up and is on it's way. USPS is not a guaranteed delivery time service. Generally packages are delivered in 2-3 days but, if they do not make it in this time estimate there is not anything we can do. Some USPS packages occasionally get mis-routed and have taken 2+ weeks to be delivered. There is nothing we can "check on" for Priority Mail including where in the route it is located or the delivery date. With Express Mail, FedEx and DHL on the other hand, these services do have a guaranteed delivery time and true tracking and we can check on the location of the package. When Choosing FedEx Smart Post or First Class Mail Please be aware these both have a default insurance of $50 within the US and Cananda. Transit time for both of these are estimated at 2-7 days but can take an upwards of 10+ days there is no guaranteed delivery window. FedEx and DHL do not ship to PO Box addresses. If there are any problems processing your order (e.g., payment, processing) we will send an email notification and the order may be held up until a response is received. Most orders(98%), if made before 4:00PM Eastern time will ship the same day. We will make every effort to ship your order out as quickly as possible but, due to the custom nature of some of our products such as modified power supplies, large sleeving orders, and modded cases, Custom Reservoirs, Etc. these orders will generally ship out within 72 business hours of reciept. Heavily modded cases, water cooled cases please allow a min of one week for build. We will not jump orders ahead of others just because you pick Next Day Air shipping! All case mod, laser, large sleeving jobs, custom services type orders are completed in the order they are received. We will generally only ship complete orders. If your order includes an item on back-order, we will contact you regarding the back-ordered item with a choice of holding the order until the back-ordered items are in or removing the back-ordered item from the order. You may also elect to pay a second shipping amount if you want the order split up. We understand that after completing an order you may realize that you forgot to add or have decided that you would like to add more parts to your order. If this is the case please email us as soon as possible requesting to combine your orders, in the email please include your order numbers. If you have not yet placed the second order please email asking us to hold the first order so you can add to it. We are only able to combine two orders, combining orders requires us to issue refunds on shipping, this takes time and transaction fees are also applied. If your order has already been shipped but is still in house or has already been packed and is waiting to be shipped we cannot combine your orders. We ask that you understand that at times we have hundreds of packages in the shipping department. When we have to stop to try to find a package, void labels, unpack and re-pack an order it takes time away from other people’s orders going out that day. Our goal is to get your order processed and in your hands as soon as possible. When placing the second order please do not choose store pick up, if store pick up is chosen the order will be canceled and you will be notified. If you are adding one or two small items such as fittings or connectors please choose the least expensive shipping method. If you are adding more please choose the same shipping method as your first order. Before completing the second order, in the comments add “Please combine with (your original order number)”. After the order is placed please email either the shipping or sales department with the order number. If you do not email with the order number we cannot guarantee that the orders will be combined. Discount codes cannot be applied to your second order retroactively. If your first order has a discount code and your second order does not qualify for that discount for any reason we cannot apply it for you. We apologize for the inconvenience, but again this takes time away from other people’s orders and incurs additional transaction fees. Once we ship your orders all excess shipping fees will be refunded in the original form of payment. Please note that all shipping charges include a transaction fee, even though we are combining your orders the fee will still apply to both orders as two transactions were made. If your orders combined are $500 or over there will be insurance and signature confirmation added automatically. There are no exceptions on this, so please be aware before requesting your orders be combined. Orders Containing Preorder items while not ship until the Preordered items has arrived at our facillity. If you wish to backorder the item please contact us at Sales@performance-pcs.com keep in mind this may require some additional shipping cost if sent separate from original order. The customer must contact Performance Pc's within 72 hours (not including weekends) of any shortages or mistakes in an order upon delivery date. Any notifications of shortages/wrong items after 72 business hours will NOT be honored! You are expected to open and inspect your delivery immediately after you receive it. Please make sure you dump all packing material out, look for small items being taped to larger ones and even look under the bottom box flaps before you contact us for a shortage. Also please look at your Packing slip on the side of the box. If the items are all checked off and the packing slip is initialed twice in the "Packed by" and "Verified By" spaces; the product should ALWAYS be all included in the box. In the event that you receive incorrect parts Performance-Pc's will cover the cost of shipping however, these items will be sent either USPS Priority mail or ground shipping. We understand that sometimes after you place an order you may have second thoughts and wish to cancel. Performance PC's fully respects our customers decisions but, any order placed using a credit card or Paypal and then refunded will be assessed a 20% restocking fee even though the order has not shipped. The reason for this is that we, the merchant are charged the discount rate on every transaction we process which includes both the charge and the refund. Plus the time involved with canceling orders, unpacking orders already picked, and putting items all back on the warehouse shelves takes labor time. So, while we like to accommodate our customers in every regard, we cannot lose money on doing refunds. So, please be very sure you wish to proceed with your order before you submit button when using a credit card or Paypal! If you are not satisfied with your component purchase, you must contact us within 3 business days of delivery to be eligible for a refund or exchange. THERE WILL BE ABSOLUTELY NO REFUND OR EXCHANGE OF ANY CUSTOM SLEEVED POWER SUPPLY, MODIFIED CHASSIS, custom made to order items, or any custom modified part that is no longer a stock ! This includes custom made vinyl, lasered parts, cables, sleeved hardware other then single wired hardware (ie. fans) and vinyl dyed drives. We also cannot accept back any chasis, water cooled parts, water cooled kits, heatsinks, chasis that are used, mounted or have been installed(This includes having any fluids run throught it). If you have a defect or problem with a installed water cooled part then the support and RMA must be direct through the manufacturer but, with our assistance always to help. Any products that are cut to order; ie., wire, sleeving, tubing, etc. cannot be returned for any reason. Finally, we do not accept returns for unneeded hardware so please be sure of the amount BEFORE ordering. All returned items must be shipped prepaid in their original cartons. We do not accept returns C.O.D. All shipping charges are non-refundable. The items must be in resellable condition without any scratches, fingerprints, blemishes, or other damage. We reserve the right not to accept a refund request on custom orders if we feel that we would not be able to resell them. Any custom modified parts purchased on this site are warranted for 30 days only. This includes pumps, power supplies, chassis and any part altered from stock condition. If you are not comfortable ordering parts with this short warranty then please do not order the products. Any modified part should be bought only knowing it is "at your risk". Generally, there are not issues with this but you must know this up front and make your own decision. Performance PC's; warranties all products for 30 days from order date. Please note: Due to the high cost of shipping defective parts back and forth Performance PC's has set up direct returns to the manufacture for the majority of the parts we get from US suppliers. We will assist in any manner setting up or helping with any RMA but understand we will have most be sent back direct to them. This will not impact at all the speed you get a replacement or credit. Overseas suppliers we will have you send the part back here to our location. Any product that is defective after 30 days of order date must be warranted through the manufacturer/supplier. If you need contact information, invoice copies, etc. to process your RMA through the manufacturer please contact us via email. International Orders RMA Policy is the same as the domestic US policy other than the customer has 45 days from the order date for us to handle product RMA but, the customer is responsible for any return shipping charges to their country of the product replaced. To return a product based upon Performance PC's, Inc. replacement/return guarantee you must fill out and RMA form on our website within the guarantee period for the product (described above). Once an RMA is received via our website cart, Performance PC's, Inc. will issue an RMA number that is valid for 30 days within which return products must be received. Performance PC's, Inc. will not accept returns without prior authorization and an RMA number. RMA numbers will not be extended or reissued. Customer should prominently display the RMA number(s) on the shipping label of boxes containing the returned product. 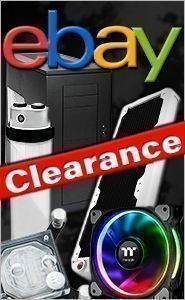 All motherboards, processors, video cards, SSD's, HDD's, Memory and Chasis are sold as a convenience to the customer only and not for us not make much if any profit. Margins on average are only $10-12 for these products. For this reason all these products previously mentioned that have RMA issues are handled only direct with the manufacturer. If you cannot accept this policy please do not buy these products from us. The customer is solely responsible for shipping any returned product to Performance PC's, Inc. including any shipping charges. Customer agrees to use only reputable carries capable of providing proof of delivery and insurance for the entire value of the shipment. Customer agrees to bear all shipping charges and all risk of loss for the return product during shipment. Customer agrees that all returned products will be 100% complete, in resellable condition, and will include the original packaging material, manuals, blank warranty cards, and other accessories provided by the manufacturer. If any component of the returned product is missing, Performance PC's, Inc. Return Procedure will be breached and Performance PC's, Inc. will reject the entire return or may choose to impose additional charges against the customer for replacement of the missing component(s). Performance PC's, Inc. will not refund to the customer the original shipping charges. In addition, Performance PC's, Inc. will assess a 20% restocking fee against the customer's account on all returns for refund. Optionally, you may choose a Full Store Credit for the parts returned if you do not wish to lose any restock fee. In the event that an item with a manufacturers defect is received, we will assist with your RMA back to the manufacturer. Because many of our suppliers are overseas and international shipping is expensive you can send the item back to us and we will process the RMA for you. Please note that we are a re-seller, because of this we cannot be held liable for any manufacture's defect. The customer is solely responsible for the shipping cost back to Performance Pc’s however, we will cover USPS Priority mail or ground shipping to send your replacement item back to you. In the event item(s) do not meet our requirements to be accepted back, it will be the customers' sole responsibility to make the appropriate arrangements have the merchandise sent back. Customers have the option to have the products held until their next order and then we can combine at no additional cost or we can have out shipping department contact the customer with shipping options with costs. If the customer does not make the arrangements within 2 months from the time the customer was originally contacted regarding item(s) that are not acceptable, the customer then forfeits the merchandise and it will then be disposed of. To request an RMA number please submit via online form HERE .